Today we're pleased to announce the release of the second volume in Grandmaster Richard Pask's projected five-volume Logical Checkers series. Volume 2 is entitled Freestyle Expert. 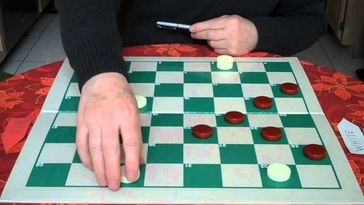 Following on the heels of the highly successful first volume, Checkers for the Novice, the new book delves deeply into tactics, endgames and mid-game formations as well as landings and various freestyle (go-as-you-please) openings. You can get the new book in its first electronic edition from the Richard Pask page as linked in the right column, or directly here. Through Mr. Pask's generosity the book is provided completely free of charge. The book runs to about 180 pages with over 150 diagrams and numerous illustrative games. To demonstrate one small part of the content of this wonderful new book, here's the run-up to a sample tactics situation. 11-16 24-19 7-11 22-18 3-7 25-22; 10-14? 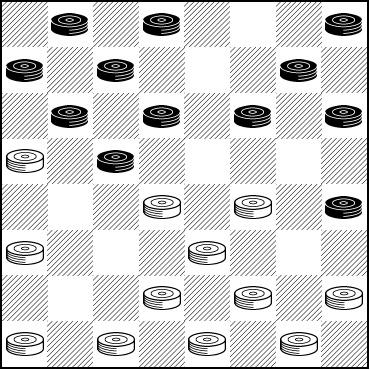 ?---A 22-17 7-10 17-13 16-20---B, to the diagram. B---2-7 29-25 16-20 25-22 14-17 21x14 10x17 19-15 12-16 28-24 17-21 24-19 8-12 15x8 4x11 19-15 7-10 15x8 White Wins---Ed., with KingsRow. To see the solution, simply download the new book and turn to page 123. Our thanks as always to Mr. Pask for according us the privilege of editing and publishing his work.